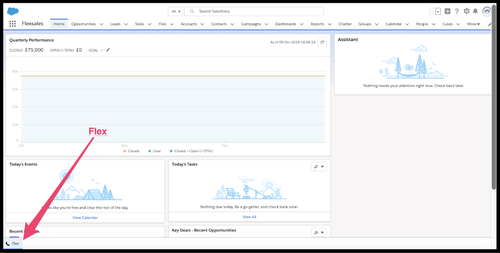 With out-of-the-box support for Salesforce CTI Connector, you are now able to power your Salesforce CRM with Omnichannel Communications offered by Flex. 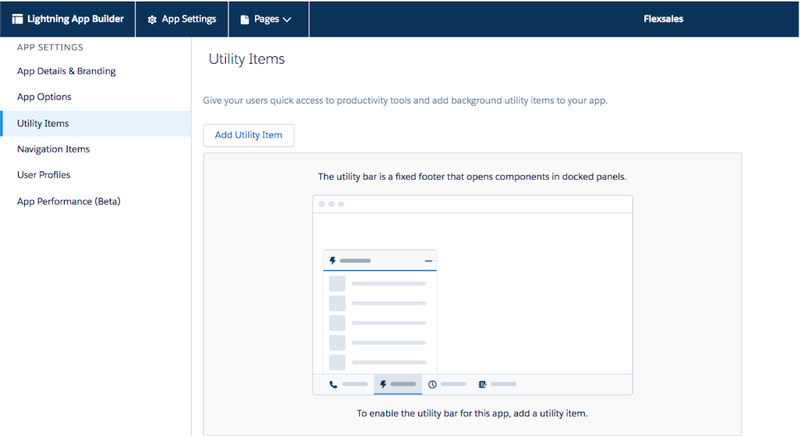 Both Salesforce Classic and Lightning integrations are supported, allowing you to use Flex directly within your Salesforce instance. In this guide, you will learn how to configure Salesforce, Flex, configure outbound calling, enable SSO (Single Sign-On), and launch your integration. 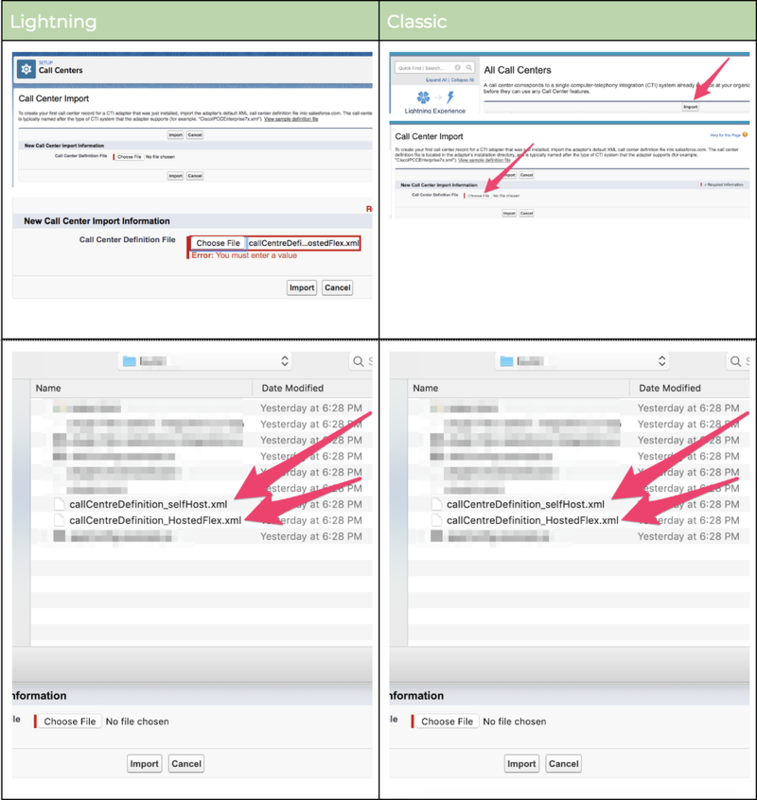 Select this option if you want to implement Flex-Salesforce Integration behind an SSO. (Optional) If you want use a Workflow different than the default Workflow, please supply the Workflow SID here . If not, leave it empty. (Optional) If you want use a Task Channel different than the default Voice Channel, please supply the TaskChannel SID here . If not, leave it empty. Need to create a new Salesforce project for your proof of concept? Create a Salesforce developer account at https://developer.salesforce.com. 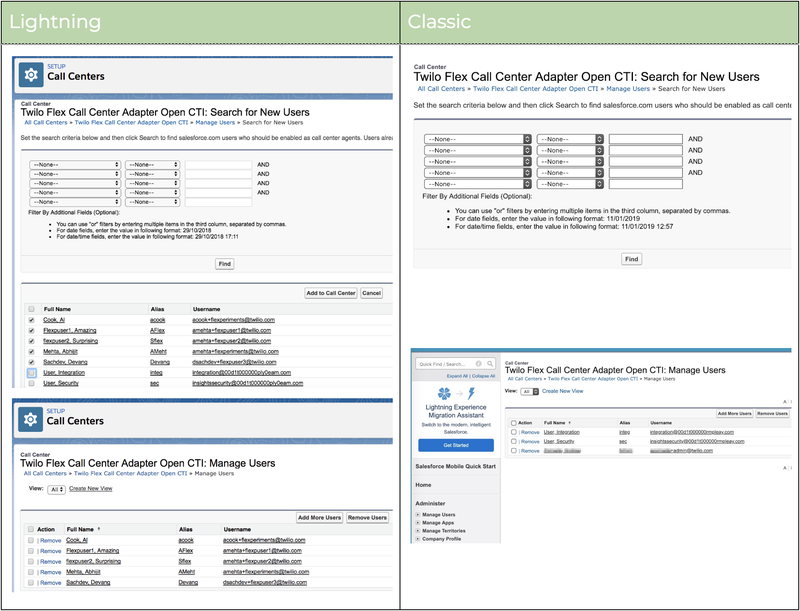 In the left-hand search box, search for “Call Center.” Then, click on Call Centers. In order to make sure your agents are directed straight to your SSO provider's screen, we recommended that you modify your Call Center settings to change the Flex URL from https://flex.twilio.com/agent-desktop/ to https://flex.twilio.com/yourRuntime-Domain-3869. 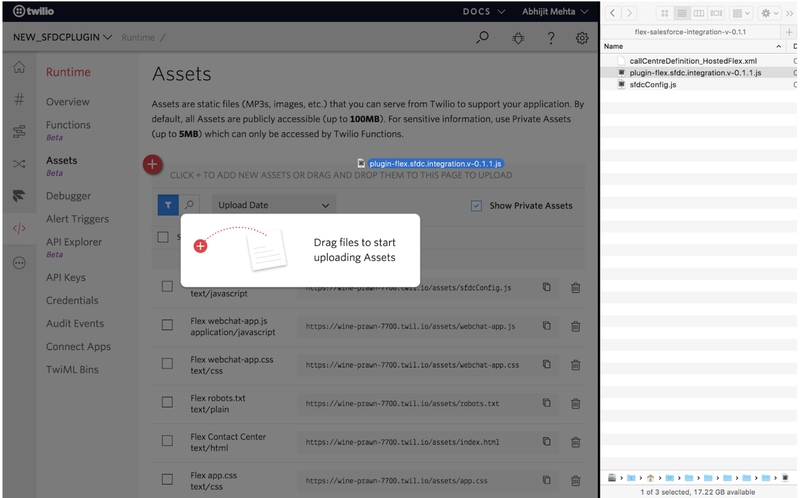 Please note that instead of downloading the above assets, you can also directly point your implementation to the Asset Source Path mentioned. By default, pointing your implementation to the source path will sign you up for automatic updates – if you do not wish to subscribe to automatic updates, it's best to download the assets instead. Populate the relevant information in this file depending on your needs. At the bare minimum, you must define a global default CallerId in the sfdcConfig.js file if you have not defined a unique caller ID for each agent in their worker attribute. Next, navigate to Runtime>Assets in your Twilio Console. Confirm your asset upload. You will see a green notification banner letting you know when your function has been deployed successfully. Navigate to the Flex-Salesforce integration template in the Twilio console and click on create. Close the window once the functions are created and visible in Runtime>Functions. To ensure that we only route the call to the worker that clicked the phone number, we'll need to create a routing rule. 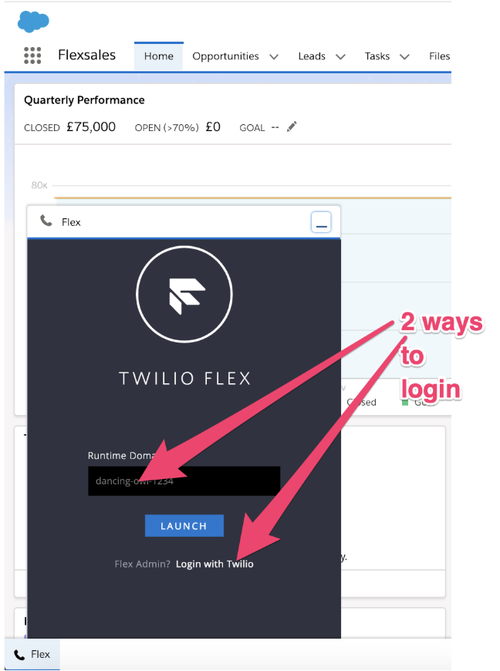 For your Proof-of-Concept, MVP, or development project, you can use your Twilio Credential to log in as admin via the Flex login screen. For any Production implementation, you might want to configure Single Sign-on on Twilio Flex by integrating your Identity Provider. See this guide to learn more about configuring SSO for Flex. Make sure you define a worker attribute callerId through your SSO setup. We recommend defining a default outbound Caller ID as described above. 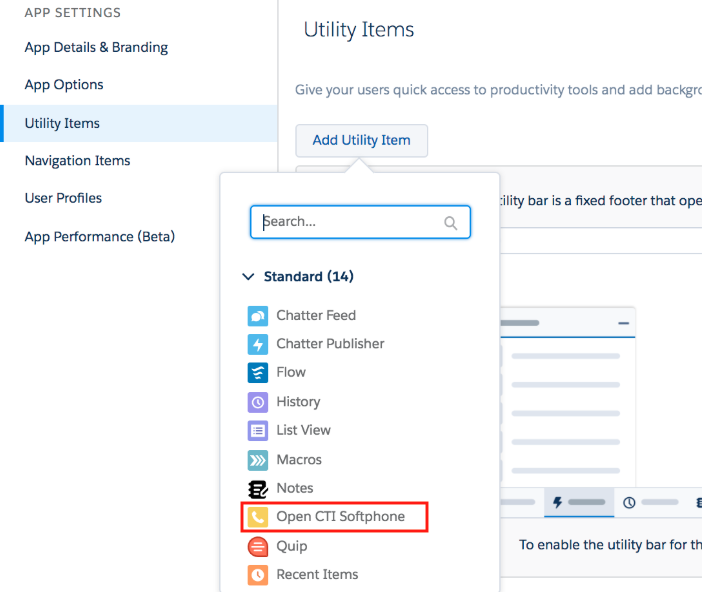 If you haven't configured any Salesforce application to use OpenCTI in the utility bar, you'll need to follow these steps first. Click on the App Launcher and go to the application that you've configured with open CTI. Find Twilio Flex in the bottom left corner of the screen and click on it. 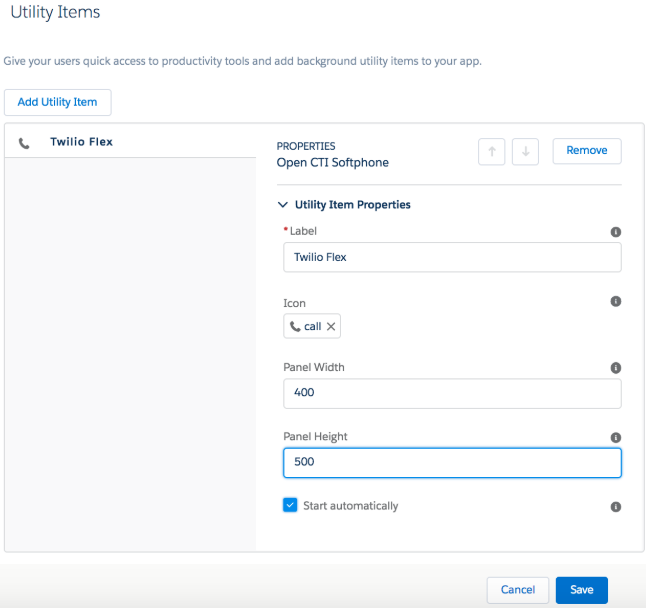 Once logged in, you will have Twilio Flex inside of Salesforce Lightning and ready for use! Find Twilio Flex in the bottom right corner of the screen and click on it. 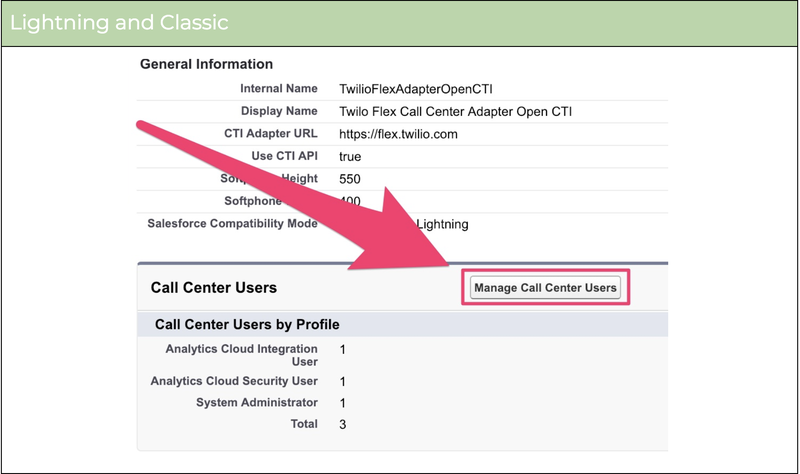 Once logged in, you will have Twilio Flex inside of Salesforce Classic and ready for use! And that's it! 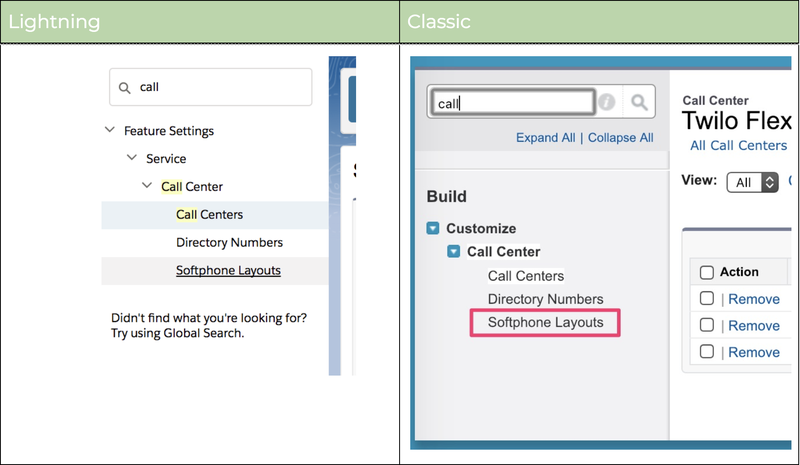 See our guide on Call Flows to take it for a spin.